Place chicken in a small pan and cover with cold water. Bring to the boil over medium heat. Turn heat down to low and gently simmer for another 5-7 minutes. When chicken is poached through (slice in a thick area and check flesh is no longer raw if unsure) remove from water and allow to cool for 5 minutes. Then shred chicken by tearing thin strips off and place in a bowl. Spoon onto bread, add salad and serve. ooh – I’ve had this sandwich at Sonoma and also love it! Another Sonoma offering I LOVE is there ‘Turkish’ eggs on toast. It’s smashed boiled egg with ricotta, mint, olives, a little diced tomato and dukkah. Good stuff and probably not bad for GD either? Many thanks for all these great ideas. Makes the GD diagnosis easier to deal with when someone presents such a great array of meal options to try. I don’t have Gestational Diabetes, but I am pregnant and came across your website in a search for some pregnancy friendly recipes, can’t wait to try this! I’ve missing my ham and soft cheeses a lot; Thanks for having so many choices. Just on a side note to Angie, ricotta is a soft cheese which isn’t ideal for pregnancy at all. If it is pasteurised, it is fine. The soft cheese thing is generally misunderstood and usually applies to rind cheeses anyway. I know your response is two years old but I thought it was important to point that out so nobody else thinks they have to miss out on ricotta for ten long months. Ask if it is pasteurised and how it had been stored, if it is and it’s been refrigerated, you’re in the clear. 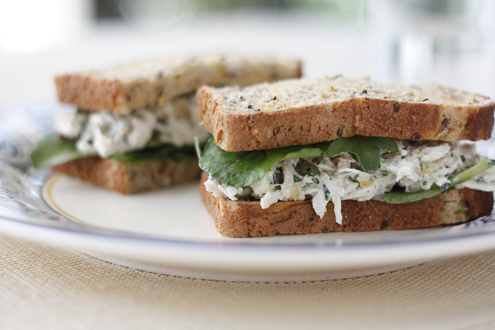 Thanks for this delicious sandwich recipe Lisa, perfect for lunches. I’ve only recently been diagnosed with GD, much to my surprise, and your recipes provide great inspiration for me in the kitchen. Looking forward to seeing more pop up over the next few months! Throwing a baby shower for a friend who was recently diagnosed with gd. Re-planning menu. Thanks!